Samsung will be home to a motion-controlled version of Angry Birds. 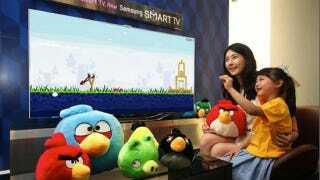 This July, the Angry Bird app will catapult itself onto Samsung's Smart TV, complete with motion and voice controls. As depicted in the above photo, players can pull back their hands to get the feeling of launching one of those birds. Put a plush toy in your lap for even more realism.